Rich Black Damascus–it's here and in stock, ready to ship! The Dragon Stalker Wakizashi is a Samurai masterpiece, evoking a since of nostalgia from ancient feudal Japan with a Rich Black Damascus steel blade. Crafted in the same style as the wakizashis of that time period, this Dragon Stalker wakizashi features a sharp, heat-forged Damascus steel blade with dual blood grooves. 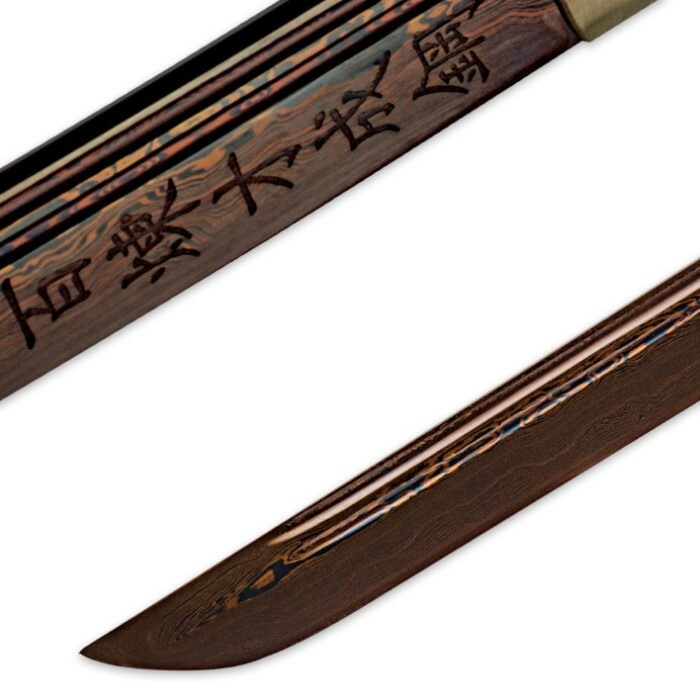 Like the wakizashis of old, the handle features ray skin construction and heavy cord wrappings, accented by a cast zinc alloy tsuba and pommel. Ornate details like the brass habaki and menuki add even more authenticity to this storied Samurai weapon. 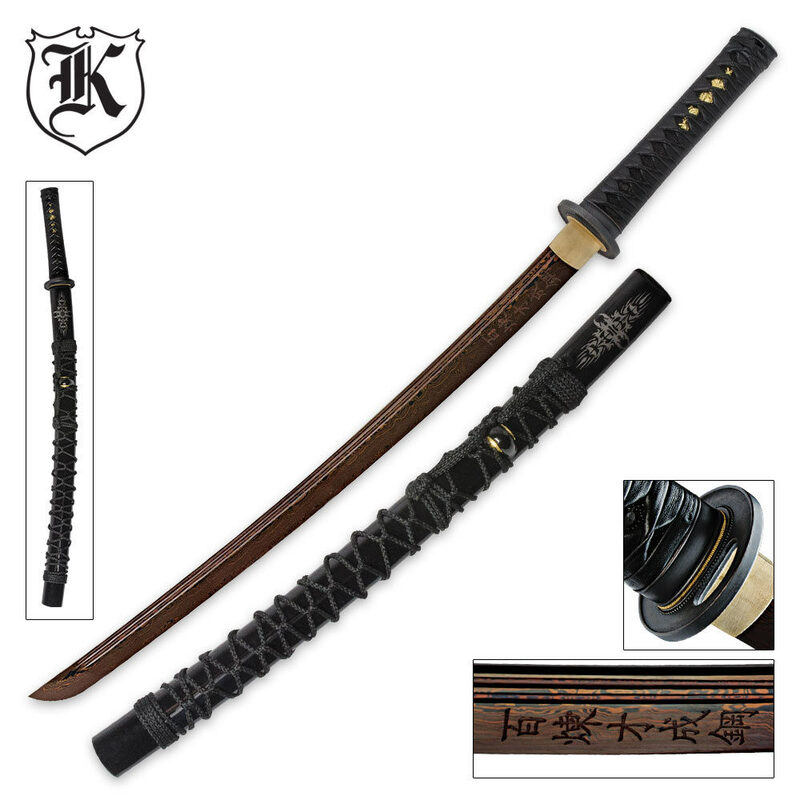 Included with this wakizashi is a high-polish, lacquered hardwood scabbard to house the 21-3/8"" Rich Black Damascus blade in authentic Samurai style. Measures 30-7/8" overall. It is a very sturdy sword. Although the scabbard wrappings don't really hold up well after period of use. The blade doesn't pull free from the scabbard very well but that can be adjusted if you file the inner portion down a little bit. Did not come very sharp but sharp enough to do the job. With a little TLC this sword is a great piece to add to any inventory. I'm shocked that these don't have any reviews. This is a great sword in my admittedly novice opinion. It feels solid in your hands and is very tight with no rattle our loose anything anywhere. The blade is beautiful. The red Damascus is really a sight to bold and is razor sharp. While the paracord wrap on the scabbard is decorative, if you were in a pinch during the apocalypse it would come in handy. The blade also fits tightly in the scabbard and takes a bit of effort to draw but I imagine it would pull just fine after a short break-in period.